As part of a larger effort at the airport, its team is using LEED for Communities to help drive sustainable design. The nation's busiest airport, Hartsfield-Jackson Atlanta International, has become the first airport in the world to be awarded precertification under the LEED for Communities program. 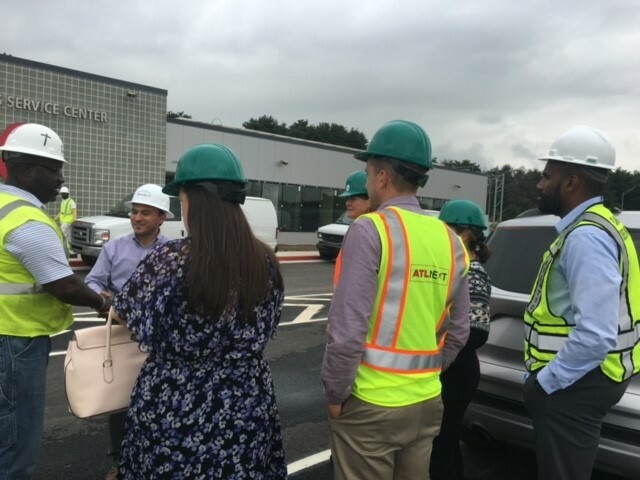 As part of a larger effort at the airport, the Department of Aviation’s Planning and Development (P&D) bureau is using the LEED pilot program to help drive sustainable design from planning to construction. 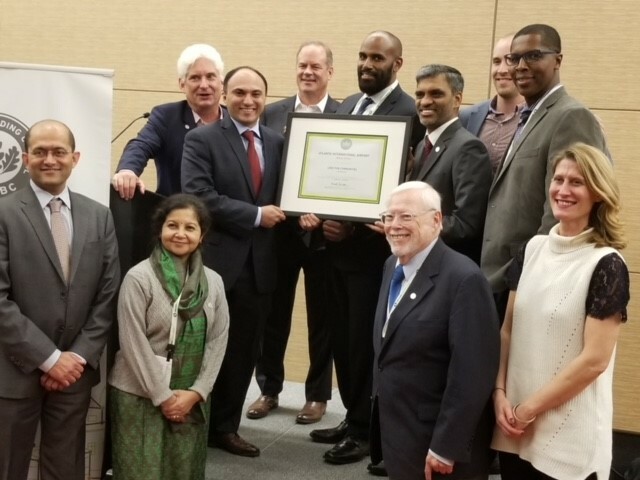 The P&D project team was recognized at Greenbuild Boston in November 2017. As a result of the collaborative effort among USGBC, P&D, and The Dragon Group, a green building consultant, the 4600-acre airport campus is one of the first to use LEED for Communities to pursue certification. Precertification is achieved once projects clearly define the project scope, establish goals, identify stakeholders, create a governance structure, set up measurement and begin tracking key metrics. The P&D sustainability team accepts the precertification award. Photo credit: The Dragon Group. LEED for Communities measures sustainability performance on a large scale. The program uses Arc, a digital platform that tracks the performance of any project, from a single asset to an entire city. Arc generates a performance score that allows projects like Hartsfield-Jackson to benchmark and track progress and compare performance against regional and global averages. The airport is establishing a baseline performance score that, once completed, will be used in Arc to continuously monitor progress toward its aggressive 2035 Sustainability Goals. P&D has also been working closely with USGBC to start defining specific airport scoring in an effort to move all airports toward a higher level of sustainability performance. The team performs field study on the airport campus. Photo credit: The Dragon Group.